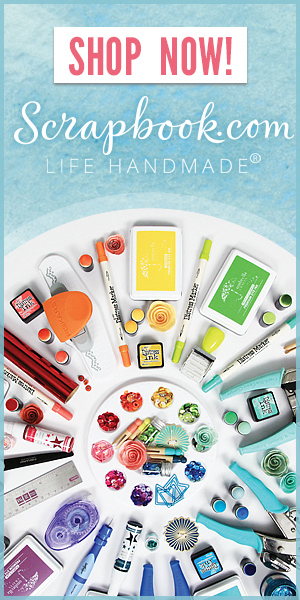 Call me old fashioned, but I love me some happy mail, and I love the idea of pen pals! When I was in elementary school, our entire class got assigned pen pals from different parts of the world. I remember being so excited, wrote my letter, and sent it off in hopes of making a friend. Days went by…weeks went by (which seems like eternity to a child), and still no letter. I wasn’t the only one to get no reply, but a lot of my classmates did get a letter, and I remember feeling so disappointed. Fast forward to the present: Thanks to social media, Instagram to be specific, I have 4 new pen pals, and they’re crafty no less! They are from Denmark, Germany, and good old Maryland. New friends, if you’re reading my blog, “Hi ladies!” Isn’t technology grand??? 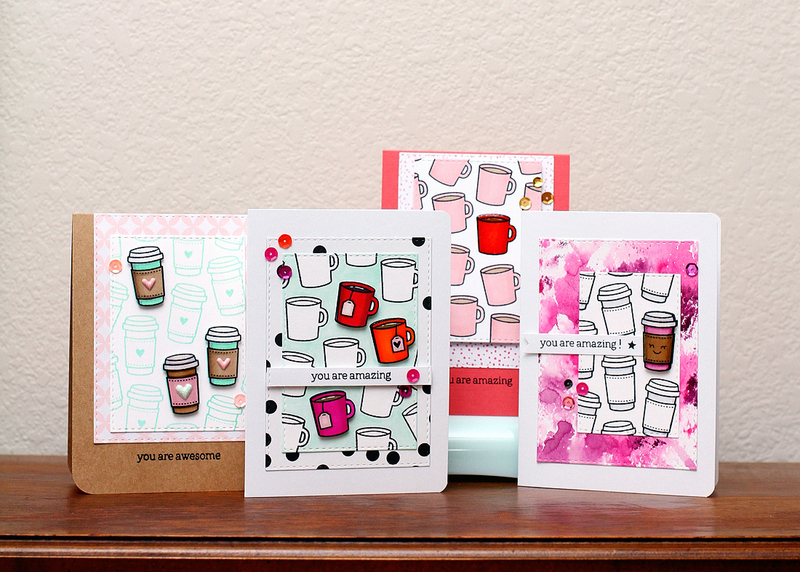 I don’t have any crafty friends “in real life,” so it’s nice to receive hand made cards! I never thought I’d get new pen pals as an adult! 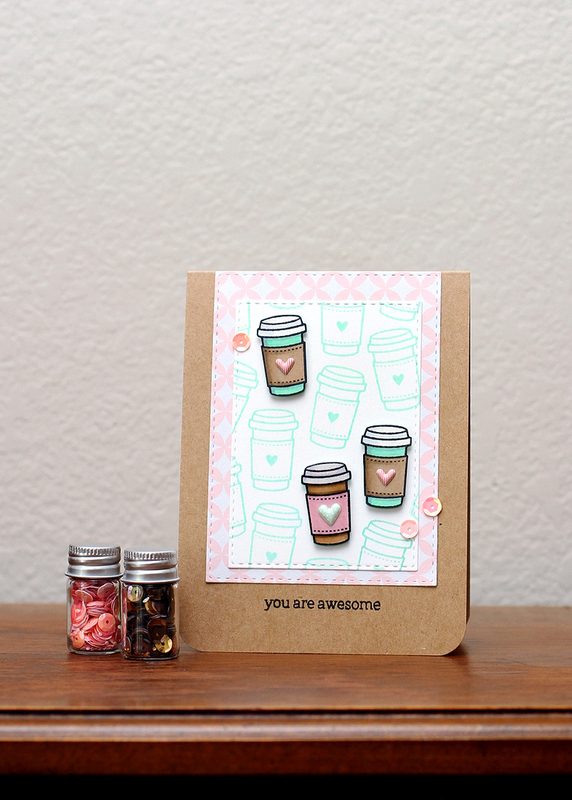 Since it was our first card exchange, and sending cards to other crafters can be slightly intimidating, I decided to keep it clean and simple, and a variation of the same card. I hope the recipients love them as much as I loved making them. Do you have any pen pal experiences? Good? Bad? Around Easter, Texas fields erupt with beautiful bluebonnets. In some areas, the flowers are so lush, and when the wind is blowing, it looks like you’re looking at waves in an ocean. When the wild flowers start popping up, parents get their kids dressed up to get their annual bluebonnet pictures…some even get their pets for bluebonnet pictures. I am one of these parents. If we get enough rain, the bluebonnets are too pretty to resist. I know that one day, I will love having these annual pictures to see how my girls have grown and changed. (That’s why I love scrapbooking.) 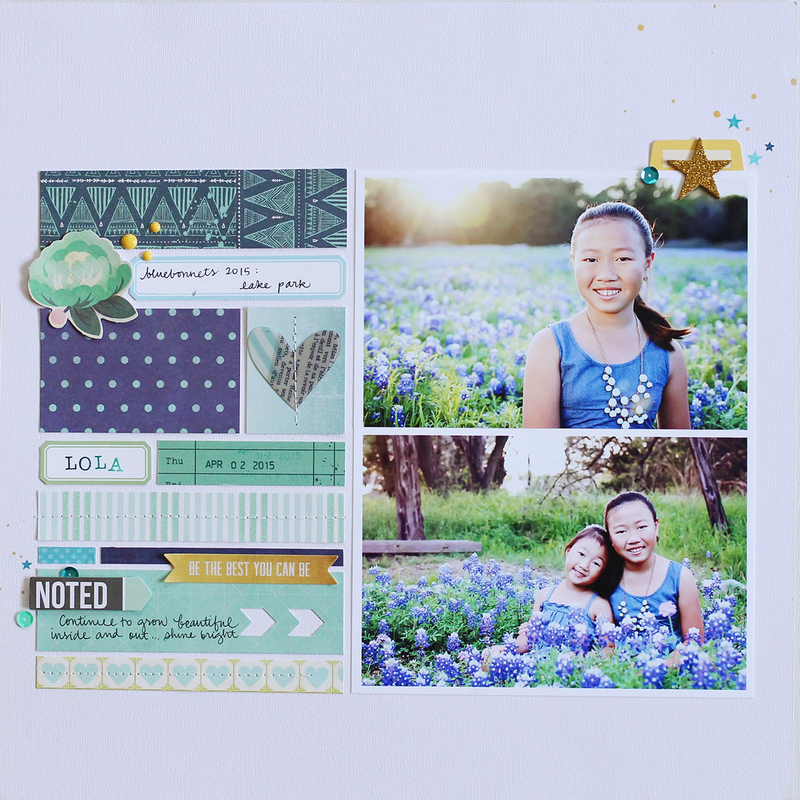 I hope that my girls won’t tire of their photog mom dragging them through bluebonnet fields for that perfect pic. 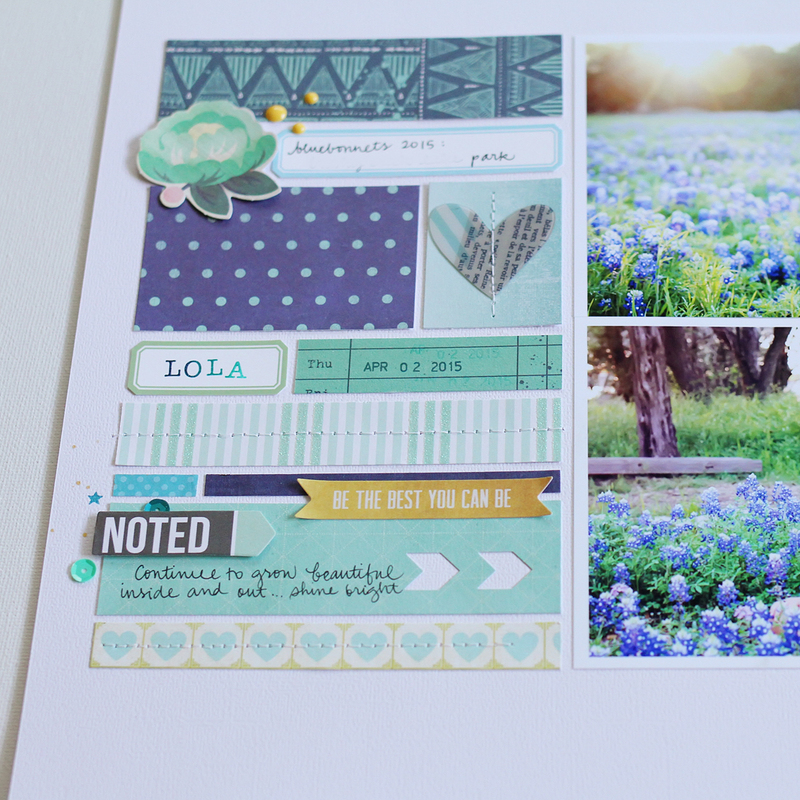 I had to scrap this year’s bluebonnet pictures, and I scrapped them 3 times. Here’s why: I have family scrapbook albums, and I have an album for each of my girls. (I told them they could take their albums with them when they get married and have families of their own.) So, I have one layout for our family album, on layout for L, and another for little E. I don’t scrap everything 3 times, but if it’s a big event (Disney! ), or I really like the pictures I will. Usually for school layouts, I make a layout just for their individual albums. Do you have multiple albums? I had just talked to an instagram friend about multiple albums, so I know I’m not the only one! 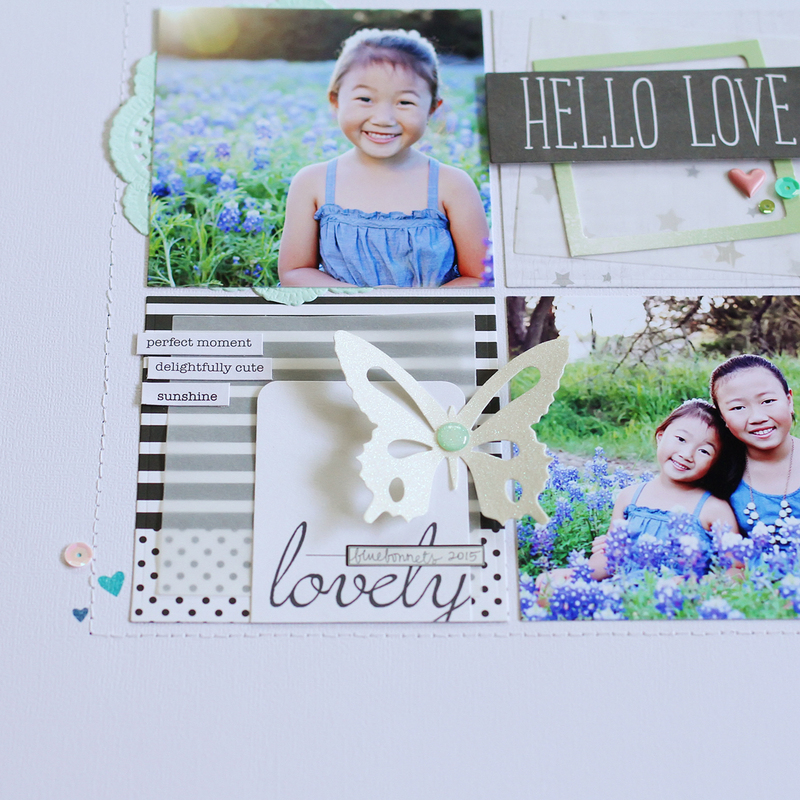 I used a lot of my scraps for these layouts…I know that I used a lot of older product. 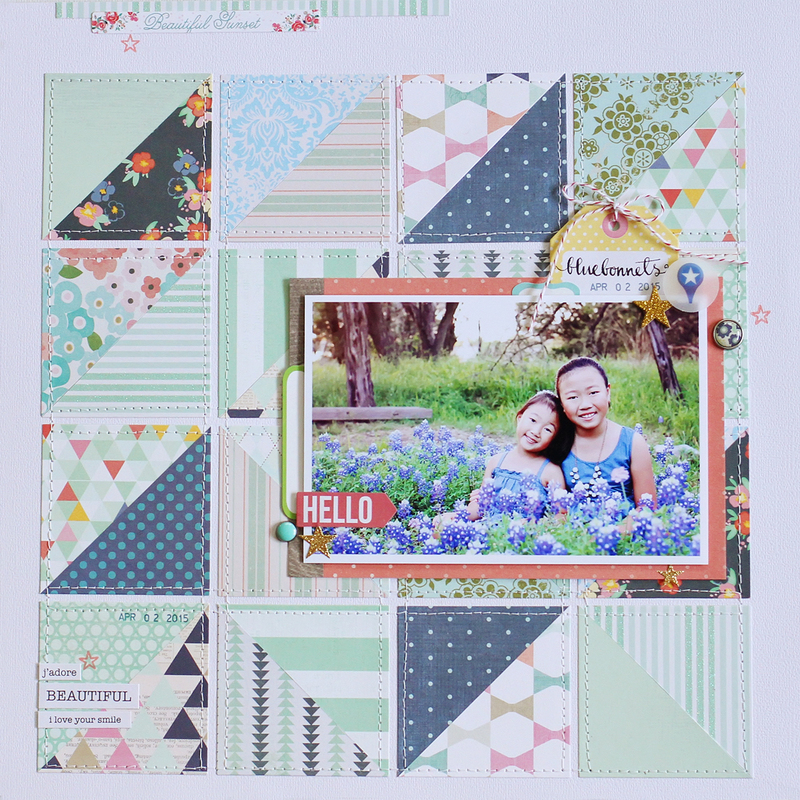 I dug through my scrap pile and pulled out some blue, green, aqua, and black & white patterned paper. I’m not too sure on all the brands, but I know that I used some of my favorites, like Dear Lizzy, Studio Calico, Heidi Swapp, Teresa Collins, MME, and Basic Grey. If you have any specific questions, leave a comment, and I’ll try my best to answer. Happy Teacher Appreciation Day & week to all the teachers out there! Thank you for all your hard work! For Teacher Appreciation day, I made some handmade thank you cards for my daughters’ teachers, with a little sweetness added… I thought I would share what I made (& bought). For my younger daughter’s preschool teacher, I made 6 variations of this thank you card. 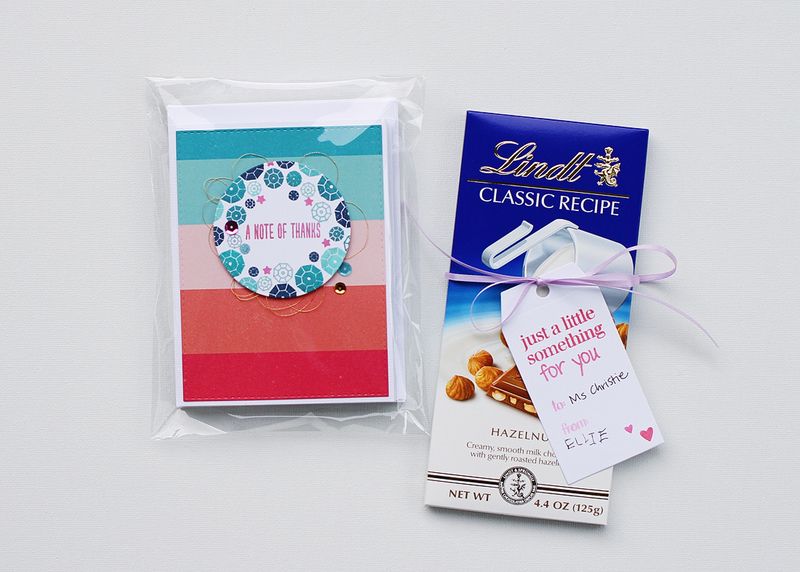 We also threw in a Lindt hazelnut chocolate bar. Since I was buying, I bought one of these for myself, and let me tell you, it will take every fiber of willpower you have not to eat the entire bar in one sitting! HA! Supplies used for the gift tag: heavy duty white card stock, hero arts ombre ink, sentiment, to & from stamps, and tag die are from a Stephanie Bernard for Sizzix set, the small hearts and stars stamps are from the WPlus9 little bits stamp set. Supplies used for thank you cards: patterned paper from Crate Paper “Oh Darling,” Basic Grey Capture, American Crafts Love Shimelle, & American Crafts Dear Lizzy polka dot party 6×6 paper pads, Simon Says Stamp stitched rectangle die, heavy duty white card stock, spellbinders circle die, hero arts ombre ink pads, gems and stars from WPlus9 little bits stamp set, sentiment from WPlus9 basic banners stamp set, American Crafts sequins, 3D foam adhesive, and gold thread. Did you buy or make anything special for teacher appreciation day? Any good ideas? It has been a busy month for us! My daughter’s & my husband’s birthdays are in April, school testing, getting ready for dance recitals, teacher appreciation week, and the end of the school year…the list goes on and on! I just have a few favorites that I have been loving for April. 2. 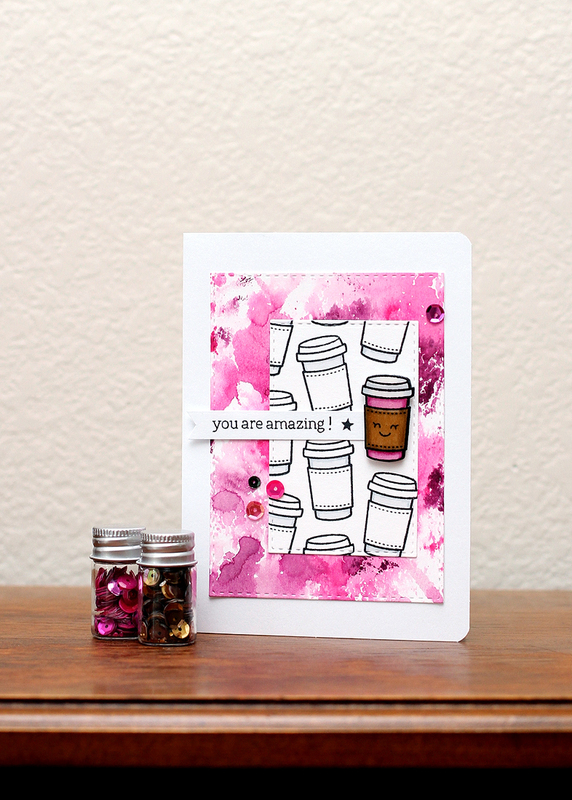 Hero Arts Ombre ink pads…OBSESSED! These are my favorite ink pads, and I just got them in April! 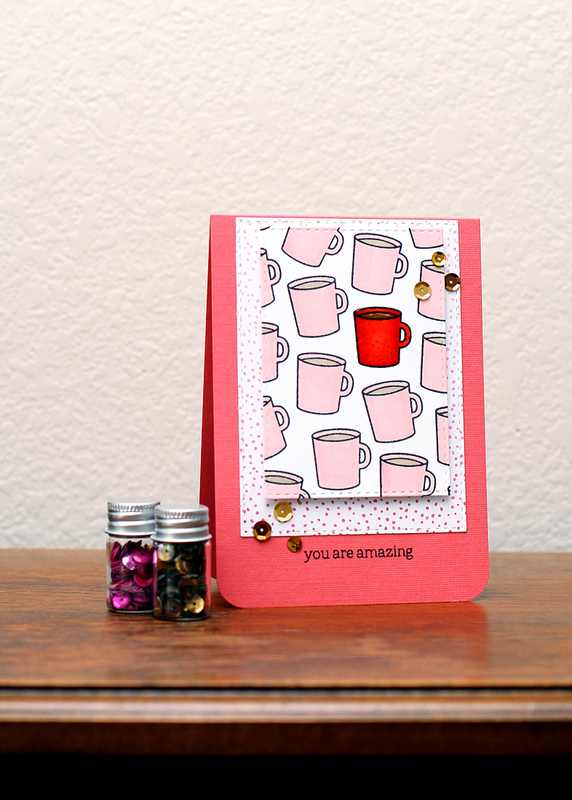 I used them to make the cards in my previous blog post. Right now, I only have the “pool to navy,” and the “pink to red,” but I want them all! I believe there are only 5 colors out now, but I saw a sneak peak floating around instagram for new colors coming out soon! 3. 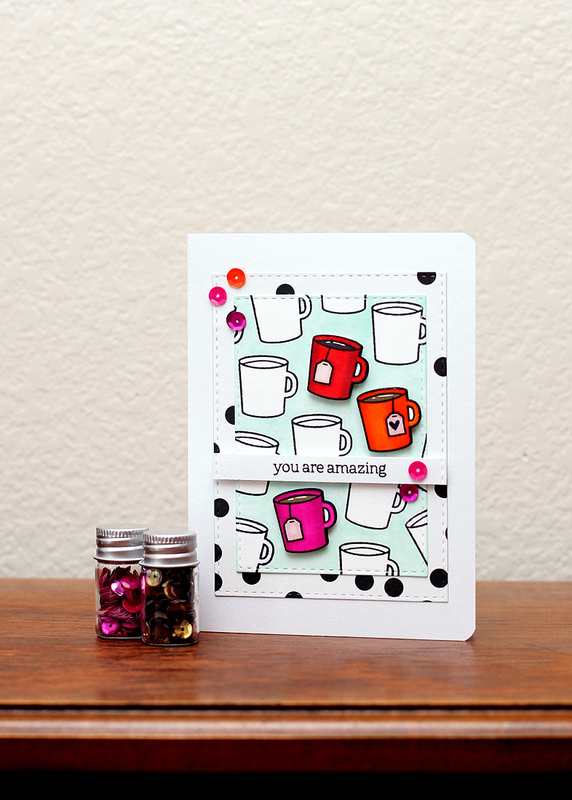 These small stamp sets by W Plus 9 are so useful! 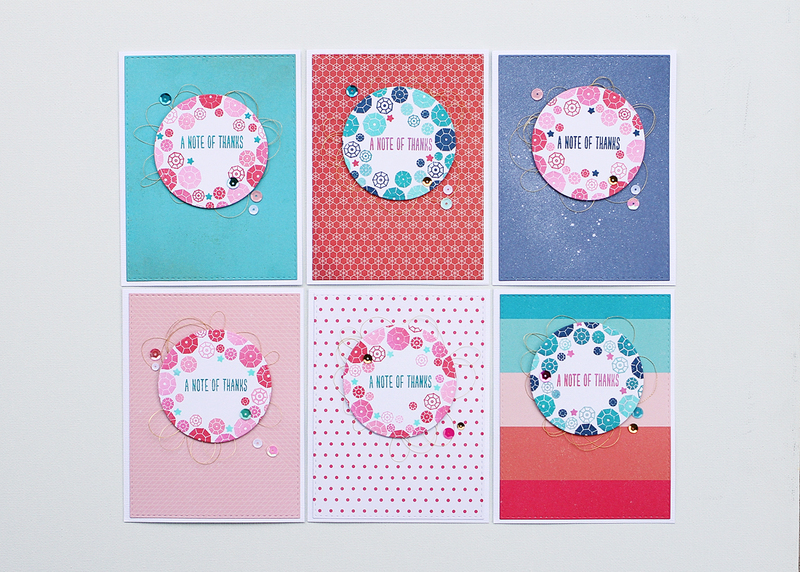 I have used them on so many projects now, both scrapbooking and card-making! 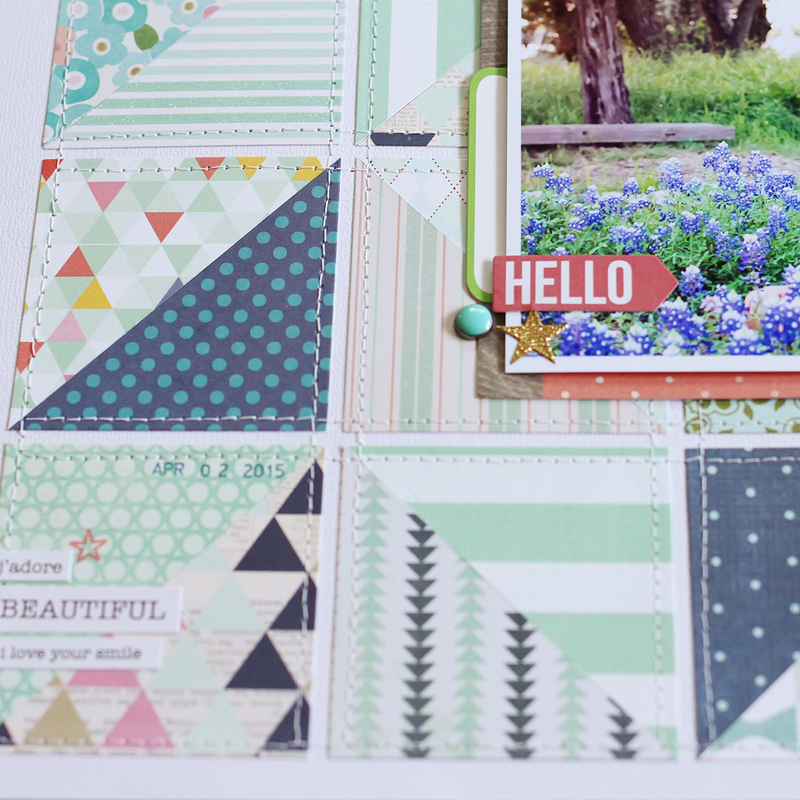 I have been using the stars in the “Little Bits” set non-stop, and I love the versatile sentiments in the “Basic Banners” set. …and that’s it! 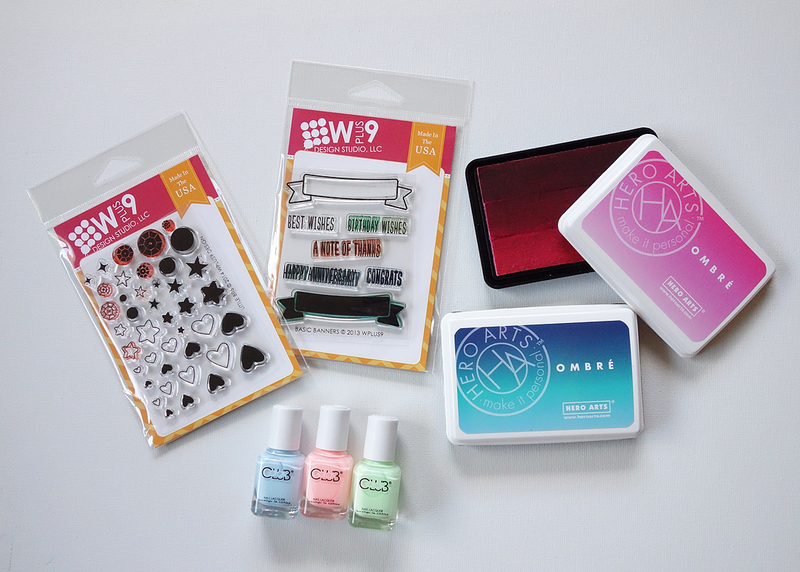 These are great staples for my craft and nail polish stash! What have you been loving?